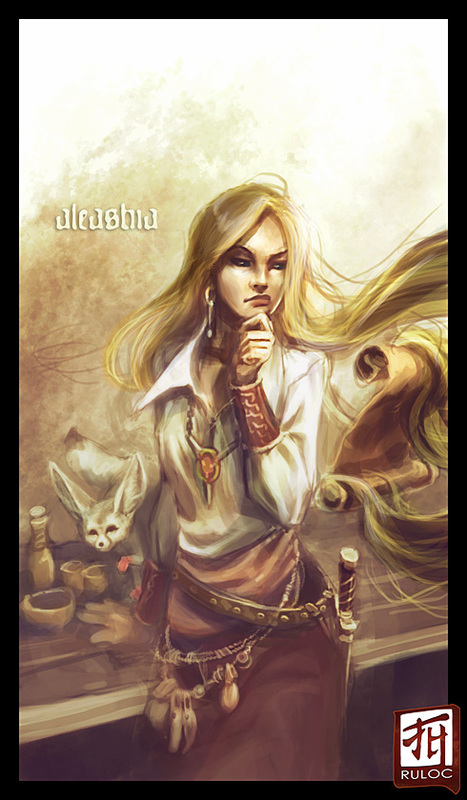 Aleashia stands about 5'6" with a slim attractive build. She has long blond wavey hair and bright blue eyes. She wears mismatched scavenged clothing...usualy a skirt, Sash, and a blouse of some type. She somehow manages to look good in these clothes. She uses a dagger and wears a holy symbol of Calistria. She has a Firefoot Fennec as a familair. Her favorite Hex is Prehensile hair. I did indeed work on some Illustrations for Legendary Games (www.makeyourgamelegendary.com) and some small things for Kobold Publishing.